In the absence of big films, the North American box office for Indian films continues crawling, with just over $1.1 Million during the weekend, slipping another 23 per cent from the previous weekend, with the openers last week continued to be the best of the lot. 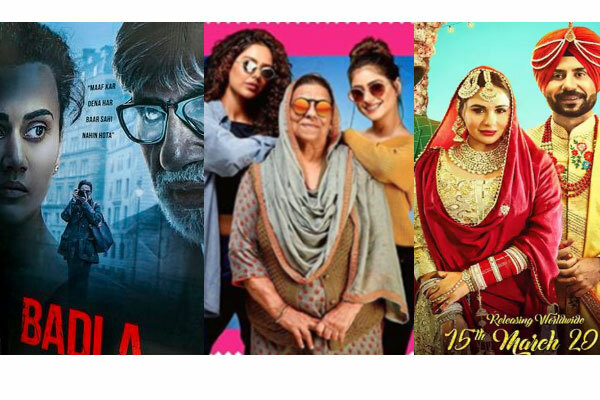 Badla remained the best desi film playing in the states with a $468k second weekend, dropping just 22 per cent from its opening weekend, for a running total of $1.32 million. The film is certain to cross $2 million in states which will be a very good total for the film of its size. In next two positions, two Punjabi films, Gudiyan Patole and Band Vaaje, with former being on top in its second weekend, dropping just 15 per cent from its opening weekend to $196k ($586k cume). Gully Boy continued its steady run in its fifth week, with $107k during the weekend, for a total which is just shy of $5.5 million. Luka Chuppi rounded off the top five with $69k during the weekend, for a total of $990k. Uri: The Surgical Strike in its 10th week, is still among the top 10 Indian films in the USA, with a blockbuster gross of $4.18 million. Following are the top Indian films in North America last weekend.